This video isn’t the crispest copy of this recently reported incident of dolphins trying to assist a member of their group. To see a sharper version, go to Newscientist.com (smaller format), or go to Americablog.com (larger format) and scroll down. The video was shot in June 2008 by a group of researchers studying cetaceans in the Sea of Japan. 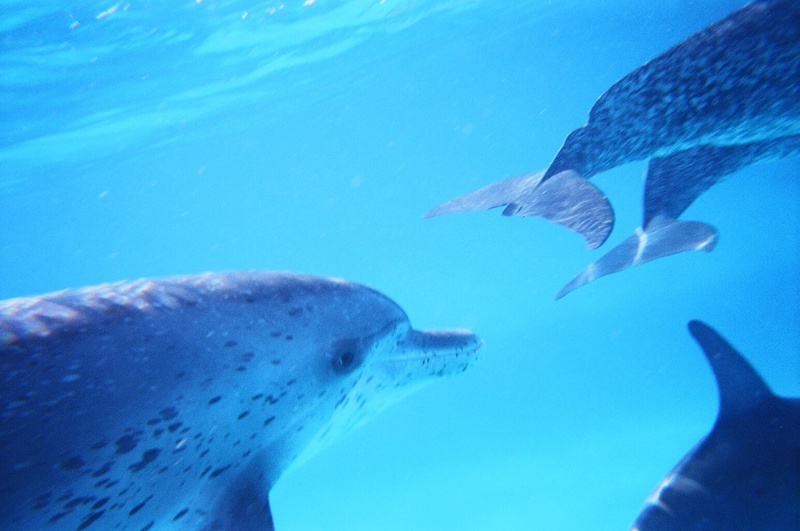 The dolphins are long-beaked common dolphins. The suffering individual is a female. Dolphins helping dolphins isn’t new. The phenomenon has been observed before. But this behavior hasn’t. As lead research Kyum J. Park and his colleagues write in a journal article on this incident, all past observations of caregiving, to their knowledge, have involved one or two animals trying to assist a calf. This time, the dolphin being helped was an adult. And, this time, it wasn’t just one or two dolphins trying to help but a whole group working together, at one point forming a kind of raft to try to keep her buoyed up and alive. She didn’t live. She died. What we don’t see on this video that the researchers also observed and Michael Marshall reports in New Scientist: Five dolphins stayed near this female after she went vertical in the water and stopped breathing, touching her body until it sank from sight. View the first page of Park’s article in Marine Mammal Science here. Download a possibly longer version of the video in Windows format here. Read Michael Marshall’s New Scientist article about what other researchers make of this incident here. Read another New Scientist article by Rowan Hooper exploring whether dolphins mourn and understand the concept of death here. This entry was posted in Amazing Animals, Dolphins & Whales, Rare Encounters and tagged Common dolphin, Dolphin, dolphins helping dolphins, Kyum J. Park, Kyum Park, Michael Marshall, New Scientist, Sea of Japan. Bookmark the permalink.